So, before we start, I was wrong about the USA. There, I said it. After that dominant fourball display on a sunny Friday morning that feels like a lifetime away, I thought that I was in business. Since then, though, they have faded badly, and limp into Sunday's singles with little chance of overturning a 10-6 deficit. I think that we can over-analyse just why things have gone wrong, and having walked 72 holes in the last two days with various groups, I can only speak accurately about what I have seen, and trust the opinions of those I respect in what they have watched from close range. This column isn't about statistics, it's about what we can see in front of us out on the course, so here goes. There's something wrong with the USA team, and I think that it started with the wind on Friday afternoon and the ability of Team Europe to manage a course that they had played several times in tournament conditions, rather than practice rounds. Once it blowed, they were blitzed, and Jim Furyk's bizarre decisions in his Foursome pairings didn't help. Phil Mickelson and Bryson DeChambeau had an entire roomful of experts scratching their heads, and they were duly torn apart by Sergio Garcia and Alex Noren. Bubba Watson and Webb Simpson also looked all at sea, although at least they redeemed themselves on Saturday, and there was a real sense of unease out on the course on that remarkable afternoon. The USA seemed rudderless, and I think we'll hear more about that in the weeks to come. There have been plenty of rumours about certain US players refusing to play with each other, of Tiger Woods paying the price for agreeing to partner almost anyone, and whether the specifics of the situation are ever revealed, there's been something wrong with the team's attitude. I've seen too many of those not involved smiling and relaxing, and that's not what I want from a team that is being torn to shreds. There are honourable exceptions of course, and chief among those have been Jordan Spieth and Justin Thomas. The latter was my recommendation for top US points scorer, and either he, Spieth or both will win that. They have been outstanding, with Thomas carried a little by his friend on Friday morning and then exploding into Saturday. He has got better the longer that the event has gone on, and I think that form will continue against Rory McIlroy in Sunday's top match. When you're up close with Spieth and Thomas, you can't help but be impressed by the focus and the camaraderie, and when I asked Spieth about Sunday's singles, he simply said that there should be no scoreboard watching, just 12 individual jobs to do for each player. He and Thomas are men on a mission, and I believe that they will both win on Sunday. There's no point in backing Thomas at [2.1] as he's already been advised in this column at a much bigger price pre-Ryder Cup, and Spieth is too short against Thorbjorn Olesen at [1.63], which means we have to look elsewhere. All that I can do is tell you what I think based on what I've seen. Prices that look too big for the wrong reasons. I like Noren against DeChambeau a lot, despite Noren and Garcia's heavy defeat on Saturday evening. DeChambeau has looked hopelessly out of sorts, and neither Mickelson or Woods had a chance after being paired with him. DeChambeau's ball striking was poor, his putting lacked confidence, his short game looked off kilter, and there were times on Friday afternoon when he looked like a member of the public who'd been given a game. Noren has won here this year, and has played pretty well in this Ryder Cup without having a Tommy Fleetwood style debut. He looks rock solid at [2.24] for the singles win, and even though this could well be a dead rubber, I think Noren will be comfortably ahead before the match is settled. Patrick Reed looks another who doesn't want to be here, and the problems he was having on the range on Wednesday and Thursday have been writ large through the event. 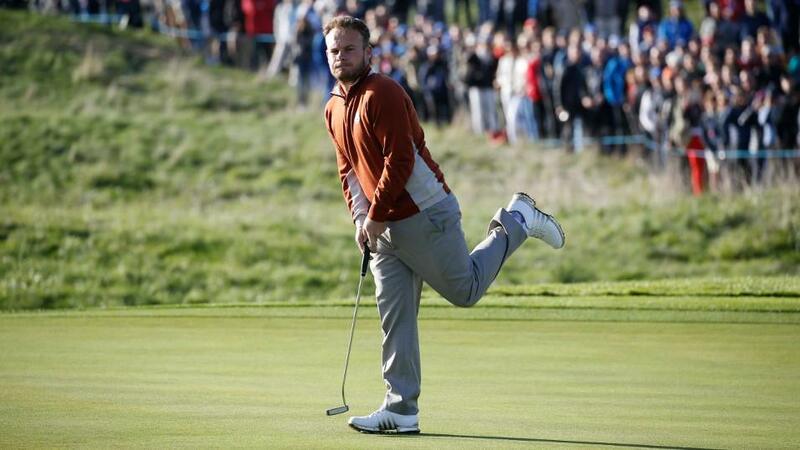 After a poor start on Friday, Tyrell Hatton gelled well with Paul Casey on Saturday, and for all Reed's singles brilliance in previous Ryder Cups, he looks like he hates this course, and I'll support Hatton to take him down at [2.06] in what could be a spiky coming together. Paul Casey is a tempting proposition against Brooks Koepka, but the American has played well with little luck so far, and for all Carey's understated contribution here, I can't take Koepka on here. This column already has Tommy Fleetwood in the book at [9.2] to be top European points scorer, and so I'm not getting involved with him again, and I just can't have an opinion on Tiger Woods against Jon Rahm as Woods looks stiff as a board and uninspired, while Rahm is only playing well in patches. Dustin Johnson, Henrik Stenson and Justin Rose all look good for points for me, while I can't see how Francesco Molinari doesn't beat Phil Mickelson. Which leaves Sergio Garcia and Rickie Fowler. There's been a lot of that Sergio spirit on view here, a lot of those highlight reel moments, but in reality he's struggled here, and looked out of consistent form. Fowler is a brilliant putter, was rested on Saturday evening, and may finally adapt properly to this golf course, one which should really suit his game. So Fowler is the third and final bet at [2.12] and I feel that Europe already have more than enough to turn the late afternoon into a relative stroll in the Parisian sunshine. The excellent golf tipping team on this website were right all along, and my outright prediction was Bryson DeChambeau to their Tommy Fleetwood. Bravo, gentlemen. To underline it, this has been a wonderful Ryder Cup, played on the kind of stadium course that we can expect to see for this event in the future. It's been a triumph of preparation for Thomas Bjorn and his staff, and while I'm not expecting a Phil Mickelson/Tom Watson press conference come Sunday night, don't be surprised if you start to hear one or two stories, and the USA to look at another Ryder Cup overhaul. They have not been good enough, in more ways than one, and Europe will be a deserving victor on Sunday night.